According to local lore, the district was originally known as Bachelorville due to the scarcity of women in the early days of settlement, and was renamed Matchettville when the bachelors married. It is probably named for members of the Matchett family who homesteaded here. Matchettville Methodist Church was built in 1898 in the northeast corner of 35-8-10 west of the Principal Meridian, in what is now the Municipality of Norfolk-Treherne, on land donated by a local farmer. 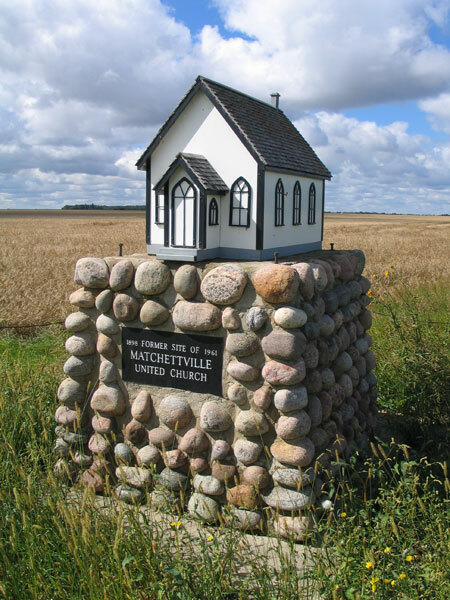 In 1925, with unification of the Methodist, Presbyterian, and Congregationalist faiths, it became Matchettville United Church. The church closed in 1958 due to dwindling attendance. Three years later, the building was sold to a Roman Catholic congregation at Cypress River. On the opposite corner of the road north of the monument is the former building for Matchettville School. Tiger Hills to the Assiniboine: A History of Treherne and Surrounding District, Treherne Area History Committee, 1976.